An auto-reversing reamer squeezes more juice from the smallest lime or the largest grapefruit. It includes dishwasher-safe parts for easy cleanups. A unique Fast-Spin feature extracts more juice from pulp. 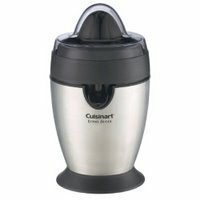 MSRP $55 Based on the Manufacturer's Suggested Retail Price, this juicer is less expensive than average and is priced in the bottom 18% of juicers. Large Feed Tube Citrus juicers are not equipped with feed tubes. Fruits are simply cut in half and pressed against the reamer. Pulp Ejection Citrus juicers are not designed with pulp ejectors. Each halved fruit is manually discarded after the reamer has pressed out the juice. Appliance Warranty 3 Years This juicer has an average limited appliance warranty. Again, the warranty is a good indicator of overall durability. Star Rating 2.6 User reviews, ratings, and feedback indicates that this juicer is rated lower than average by 159 users and ranks in the bottom 6% of juicers.